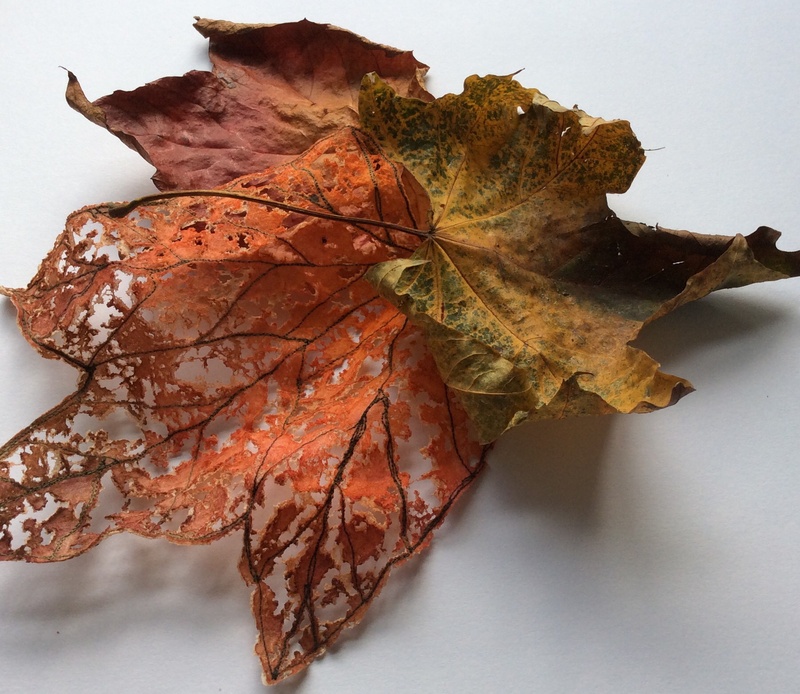 This is a skeleton leaf which I created in response to the 4th quarter challenge from the Felting and Fibre Studio. The subject matter was chosen by Zed, who specialises in felt making, and it required participants to create something along the lines of “land art”. Tyvek leaf with metallic thread and beading. My immediate thought was to create an Autumn Leaf, possibly a leaf skeleton, and photograph it with real fallen leaves. 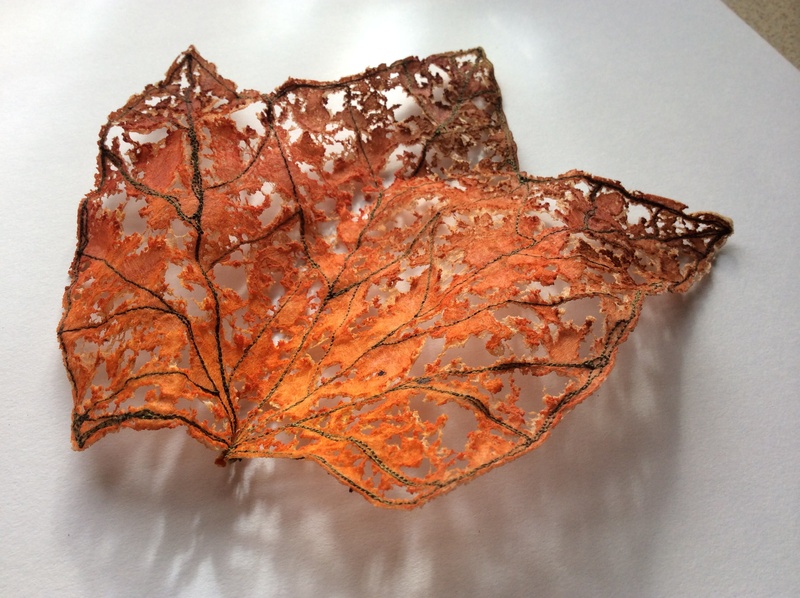 I had previously made a couple of leaves from Tyvek which were embellished with metallic threads and beads, but for this challenge I wanted to make a more natural looking leaf. 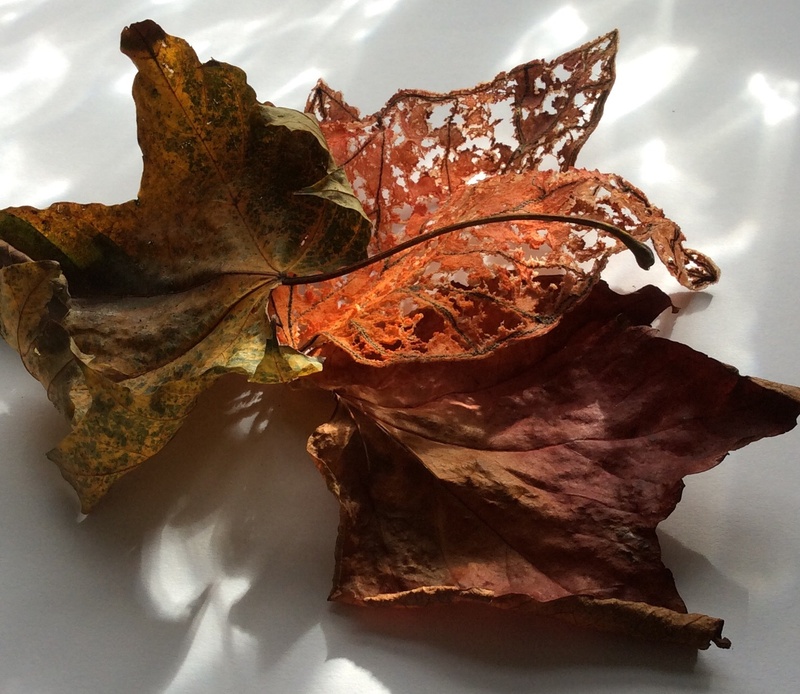 The painted leaf has veins sewn on. I thought I would try out a new material which I had bought a few months ago but not yet made the time to experiment with. It was a heavy weight Lutradur purchased on-line from nid-noi.com Lutradur is one of several Spunbonded textiles which include Tyvek, Evolon and Kunin. These are manmade fibres with strength and flexibility making them ideal for textile art. They can be washed, dyed, painted, printed, stitched, burned, fused, foiled, stenciled, and slashed with ease. You name it, spunbonded textiles can take it. I began by sketching an outline and coloured the fabric with Inktense blocks. Once the paint was dry I drew the veins, using a Frixion pen. The leaf and the veins were then machine stitched using Gutterman green 100% cotton thread and an open toe embroidery foot. Once the leaf was cut out I used my heat tool to distress it. It was at this stage that I discovered Lutradur doesn’t shrink and distort like Tyvek……it wasn’t reacting as I had thought it would. I had made the leaf larger than it needed to be thinking it would shrivel but it turns out that when you blast Lutradur with heat your work retains its overall shape and size. 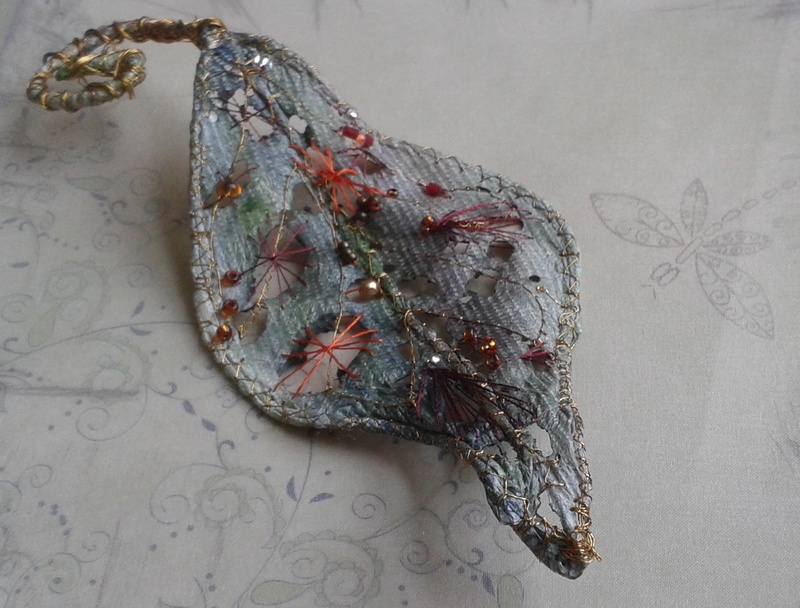 Having said that, I loved the lacy effect it created and was really pleased with the finished leaf skeleton. Distressed Lutradur resulting in a beautiful lace effect. That’s really interesting that it didn’t shrink – I would have done exactly the same as you and made the initial shape larger to compensate for the impending shrinkage! 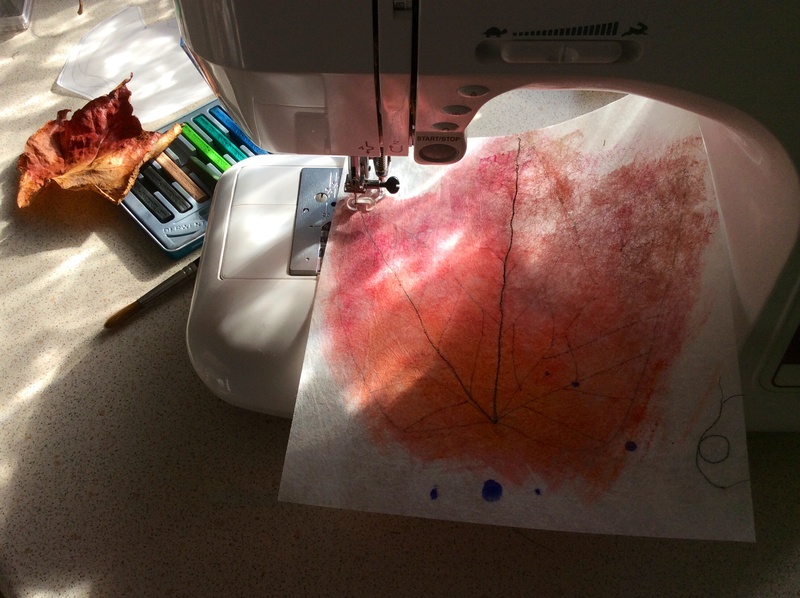 Thanks for making me smarter Karen:)) The leaf does look wonderful – very hard to tell which is the textile one! There is only one thing better than learning by our own mistakes……learning by others mistakes! 😀 Hope I’ve inspired you to try Lutradur if you haven’t done already Cath.